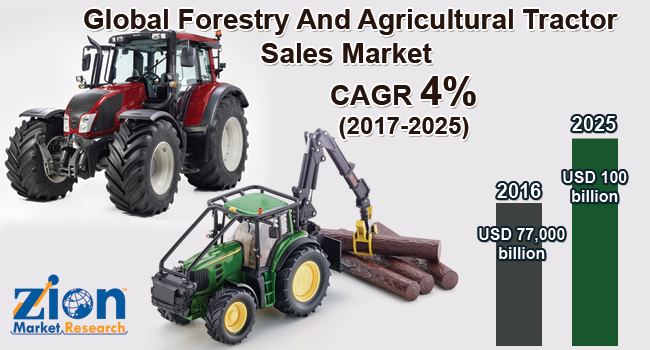 With the presence of a large pool of participants, the global forestry and agricultural tractor sales market is displaying a highly competitive business landscape, finds a new research report by Zion Market Research (ZMR). Deere & Company, Changzhou Dongfeng Agricultural Machinery Group Corporation, Force Motors Limited, and AGCO Corporation are some of the key vendors of forestry and agricultural tractor sales across the world. These players across forestry and agricultural tractor sales market are focusing aggressively on innovation, as well as on including advanced technologies in their existing products. Over the coming years, they are also expected to take up partnerships and mergers and acquisitions as their key strategy for business development, states the forestry and agricultural tractor sales market study. Citing an instance, in August 2018, Deere & company’s net income in third quarter of this year climbed to US$9.3 billion from sales of farm machinery in North America and Europe as well as construction equipment. As estimated in this report, the Global forestry and agricultural tractor sales market stood at US$ 77 billion in 2016. Witnessing a tremendous rise during the period from 2017 to 2025, the revenue in this forestry and agricultural tractor sales market is expected to reach US$ 100 billion by the end of the forecast period. “Rise in the ROI from farming activities along with need to increase crop yield are expected to lead to enhanced demand for forestry and agricultural tractor sales market in the span of next few years,” says the author of this forestry and agricultural tractor sales market study. Apart from this, reduced rate of interest on loans along with rise in the disposable incomes of farmers will create notable growth prospects for forestry and agricultural tractor sales market in the years to come. In addition, exponential increase in the population base across the globe will raise the demand for food, thereby enlarging the forestry and agricultural tractor sales market scope in the near future. Regionally, Asia Pacific has been leading the worldwide forestry and agricultural tractor sales market and is anticipated to continue on the dominant position in the years to come, states the forestry and agricultural tractor sales market study. Increasing agricultural activities, rising income levels, low labor costs, and need for enhanced crop harvest are the key factors behind the dominance of the Asia Pacific forestry and agricultural tractor sales market. The high number of market players being headquartered in Asia Pacific is another significant factor that is supporting this regional forestry and agricultural tractor sales market. India and China are likely to be the key regional revenue pockets.